“The Color of Fear” lived up to the promise of its title, seeing as The Flash #24 certainly introduced a lot of fear into my comic book life. 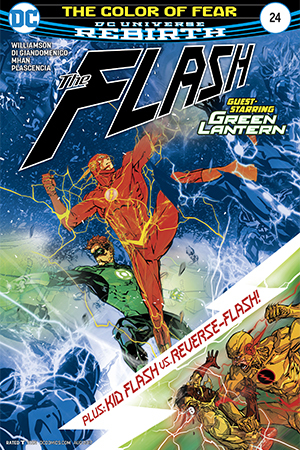 While the team-up between Barry and Hal is a lot of fun, giving us a glimpse into a much missed friendship between the two, the real meat of the story lies with the Reverse Flash. Not only is he a fitting example of yellow symbolizing fear, but he is also the living embodiment of all of Barry’s fears. The Flash is busy contemplating the consequences of not telling his girlfriend Iris West the truth in the middle of a gorgeously drawn battle with Multiplex, yet at the same time those very consequences are playing out in real time when Eobard Thawne threatens the Wests. 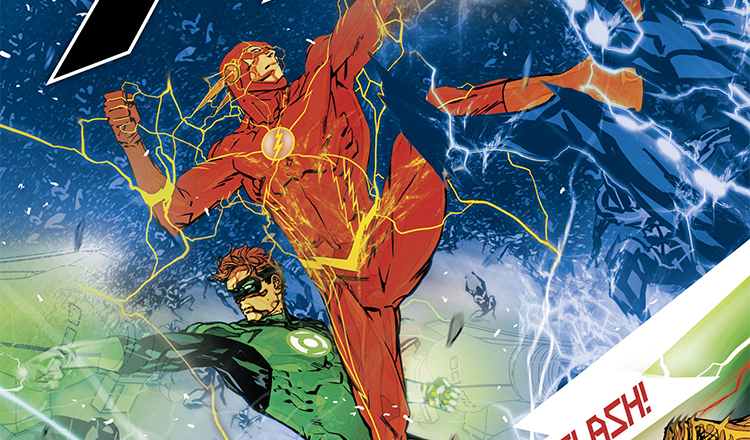 Seeing the two battles side by side was a real treat, and it helps to ramp up the tension of the outcome considerably – especially when it comes to Wally’s showdown with Reverse Flash. Both battles are filled with a kinetic energy that once more visually expresses the beauty and power of The Flash’s speed. Carmine Di Giandomenico is aided this issue by Pop Mhan, and it is to both men’s credit that their collaboration helps the issue feel fresh and new without making it obvious which artist drew which section. 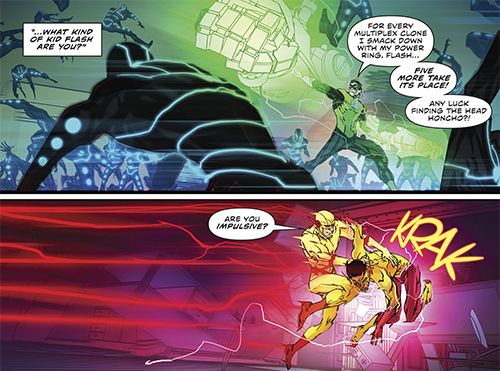 The Multiplex fight sequence may be more exciting to look at on the page, but it is the battle between Reverse Flash and Wally West that contains the emotional stakes. One thing Joshua Williamson has done remarkably well in this arc is explore how terrifying and psychotic Eobard Thawne really is. It may feel like a rehash because we all remember just how much Thawne hates Barry, and we’ve seen him try to kill Iris before, but the Eobard that shows up in the wake of his gruesome death in “The Button” is the most fascinating one yet. What does it mean to have knowledge of an entire life that you’re alone in experiencing? How will Eobard use that information against Barry and, once again, who is he talking to in the 25th century Flash museum and why? I’m going to go out on a limb and guess that Eobard is ‘explaining’ Barry’s history to Iris in the opening panels of The Flash #23 and #24. Seeing as he’s already begun twisting whichever version of reality he remembers – he’s called The Flash his best friend and suggested that Iris should empathize with him as having been hurt by Barry too – I can see him using ‘the truth’ to mess with Barry and with their relationship. The fact that I want to theorize nonstop at the end of the issue, which leaves Wally terribly broken and Iris in a precarious position, shows just how strong the arc has been. I have absolute faith that Williamson take the story in a fresh and exciting direction. That’s not the only groundwork being laid in The Flash #24, though. Ever since another Wally West came out of the speedforce in Rebirth, The Flash and the Flash family have been the beating heart of DC’s soft reboot. Now that the Reverse Flash is back in the picture and remembers it all, will he share that information with Barry and Iris? How will the truth reverberate throughout the DC Universe, and will we find out in this series or do we need to wait for Geoff Johns’ upcoming Doomsday Clock?